The Moto X has once again leaked out, but this time it’s in a fully produced video from a carrier. While we’ve gone through blurry photos, and even shots of Google Chairman Eric Schmidt using the Moto X, nothing quite beats a clear, professionally shot video. Ausdroid came across a video from Canadian carrier Rogers that shows off the phone and some of its new features, along with the news that the Moto X will be exclusive to the carrier in Canada. According to the demo in the video, the Moto X will feature passive listening that can be activated by saying, “Ok, Google Now” and then you can request information such as the weather. 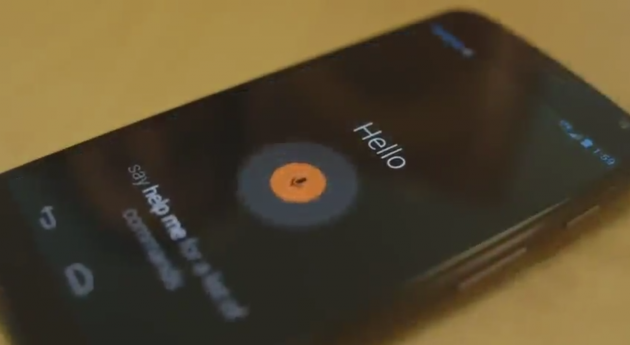 Moto X will also be featuring a new notification system according to the video. Active Updates will flash information on the screen to let you know which apps have new updates and let you take care of them or ignore them. Finally, the camera also shows off some new tricks. Need to access the camera quickly? Twist your wrist twice and it pops up. Want to take multiple shots in rapid succession? Just hodl your fingers down on the screen and it will keep shooting. The Moto X is looking better and better, now if Motorola would just finally officially announce it and let us know when to expect it.